We remember the shock we felt when we first heard the news that two bombs went off near the finish line of the Boston Marathon. Two pressure cooker bombs filled with metal shrapnel exploded 100 yards and 12 seconds apart. At the time of this writing, there are three dead, including 8-yearold Martin Richard, who walked out to give his dad a high-five as he finished the marathon, and then returned to the sidewalk. The bomb blast killed Martin and seriously injured his sister and mother. For many Americans, this attack in Boston was a reminder of the shock 12 years ago when terrorists flew planes into the World Trade Center and the Pentagon. For others, it was reminiscent of the Sandy Hook massacre last December. In fact, the marathon this year was a tribute of sorts to those who lost their lives in the Newtown school shooting. The Mile 26 marker was dedicated to signify not only that the runners had almost made it to the finish line, but also as a memorial for the 26 who lost their lives in the Sandy Hook shooting. 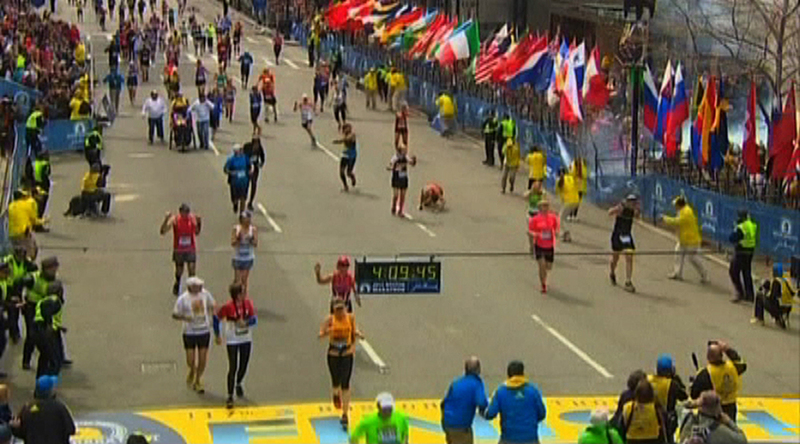 Family members of the victims were given VIP seating near the finish line, close to where the first bomb exploded. As the investigation in Boston continues, we all hope the perpetrator will be found and prosecuted. The president has pledged to give his full support to the various agencies that are tracking down clues and looking for answers. And that’s good. But there are questions many are asking in the wake of this attack. One is this: “What can we do to be safe? How can we protect our children, our family, our friends, our school, our neighborhood?” Or to put it another way, “How is evil restrained?” Is it held in check through our own efforts? Or through the efforts of others? That is a variation on the most fundamental question many in the nation are asking this week: “Why are these things happening?” Or to put it another way, “Why is there evil in the world?” That question goes right to the heart of the most important questions any of us can ever ask: Where did we come from? Why are we here? Where are we going? The question of why evil exists is as old as creation. We ask it because God who created us has written his law on our hearts. We know there is right and wrong. We can clearly identify evil in a bombing in Boston. We recognize it in the stories of Adam Lanza in Newtown. Or Dr. Kermit Gosnell in Philadelphia. By the way, the horrors of infanticide committed by this man in an abortion clinic in Pennsylvania will turn the stomach of most. Gosnell is on trial for the murder of one woman and seven babies. The descriptions of Gosnell delivering babies in the third trimester and then killing them after they survived is a portrait of evil. One employee claims he saw 100 babies whose spinal cords were snipped with scissors. We recognize the evil in this horror story. We just have a hard time seeing evil in our own hearts. Why is there evil in the world? This column cannot fully answer that. The Bible can and does. Evil exists because of sin; and it is in our hearts to sin unless God gives us a new heart. The only way we can find answers for ourselves and for the world is to turn to God. Whose children are ours, anyway? VIDEO: What did the Old Testament sacrifices do?